One: Futbol. Soccer. Football. Whichever. Take your pick. Two: Korean Food. Namely, sweet snacks and ramen. How is this related to KPOP? It’s not. 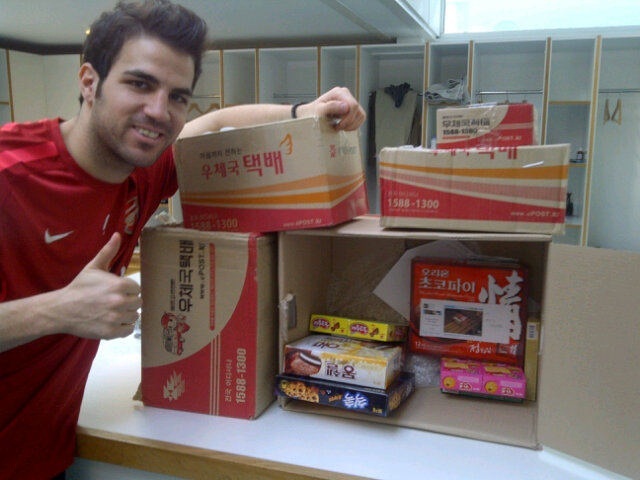 But, in the name of spreading Korean culture to parts far and wide, some soccer savvy fans of Arsenal’s Cesc Fabregas (and essential member of the 2010 World Cup winning Spanish side), sent the cutie patootie footie a box full of Korean treats! Anyone ever do anything like this for their favorite KPOP artists or entertainers? I’m always so impressed by the sheer amount of coordination and research, let alone funding, that it must take when fan clubs and individuals send their favorite idols gifts. It’s a nice thought though, and even nicer when said idols appreciate and acknowledge the effort. It’s stories like this that make me go “Awww”. And also hungry for some ramen and snacks.